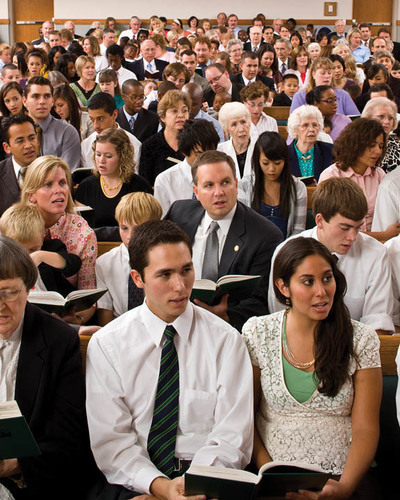 The Church of Jesus Christ of Latter-day Saints has over 15 million members (as of 2013), with more than half of those members living outside the United States. Wards (the name for a congregation) and branches (similar to wards but smaller) of the Church can be found in over 162 countries. Countries with the highest percentage of LDS members are the United States, the countries of Latin America, the Philippines, Canada, England, American Samoa, Tonga, and Western Samoa. The Church has minimal presence in China (though it does have fairly good population in Hong Kong as well as a temple there), the Middle-East, and Cuba. The Church is growing fastest in Africa, Latin America, and east Asia. Within the United States in Utah about sixty percent of the population are members. That puts the state population of Saints at just over 1.5 million members. In Idaho, fourteen percent of the population are LDS; in Nevada, nine percent; Arizona, six percent; Oregon, four percent; and the rest of the states are at about three percent. Church membership doubles approximately every fifteen years, due mostly to increased missionary efforts. In the last ten years the number of missionaries has gone up by fifty percent. There are currently over 80,000 missionaries in 162 countries (2013), and in the year 2000 alone five million copies of the Book of Mormon were handed out. 2009 Church growth in the U.S. was under 2%, but this still put the LDS Church in third place among only four religions reporting growth. The LDS Church is now the fourth largest church in the United States. Worldwide, there are nearly 300,000 converts a year plus growth through members having families. Growth of the Church outside of the United States is amazing. For example, Missionaries were not allowed into Nigeria until 1978, by 1980 there were 1,700 members in Nigeria and by 1995 there were 28,000 members. In line with the fact that about half of its members are now outside of the United States, about half speak English as a primary language. Spanish speaking members have reached a total of 3,226,000, and 780,000 members speak Portuguese. Another 1,311,000 speak a language other than English, Spanish, or Portuguese. Because of the massive growth the Church is experiencing in non-English speaking countries, the Church curriculum is now printed in dozens of languages. The huge growth of the Church means that meetinghouses and temples are needed in more places. As of 2004 there were 20,000 meetinghouses in use. As of October 2010, over 140 temples were in use, with others either under construction or announced. Rodney Stark, a sociologist of religion, estimates that the LDS Church could easily have between 60 to 265 million members by the year 2080. Where do Members of the Church Live? This page was last edited on 7 December 2013, at 21:53.